What are your favorite books on Iowa? I'm reading Emerald Horizon, which is fascinating and very well written. Aside from the Bridges of Madison County (which I enjoyed), I haven't read any other books on or set in Iowa. What's Eating Gilbert Grape by Peter Hedges ... takes place in fictional town of "Endora, Iowa" ... although a fictional community, this reading does a great depiction of rural Iowa life. Shoeless Joe (bases for the movie, Field of Dreams). "What's Eating Gilbert Grape" was a great movie. I'll check out the book. Thanks! Non-fiction: "Lost Continent" by Iowa born Bill Bryson. Not completely about Iowa, but enough to be a little Iowa-centric. Great analysis of Des Moines and people from here. It's a really good book, it's like if Clark Griswold wrote "On The Road"
I'm a big fan of the book the Bridges of Madison County- it really gave IA a good book almost anyone will like. 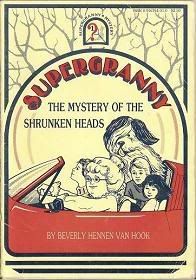 I'm going to go with the completely unknown Supergranny childrens' book series, by the late Beverly Van Hook. They are loosely based in the Quad Cities. I read them over and over as a kid. I don't know if any bookstores still have them, but they can be found online.